1947–49 Association looked for a right place for building of ZOO in Pisárky, Medlánky, Královo pole (farm VSZ) and in Bystrc. In the end was lucky chosen place – Monk's mountain (Mniší hora) in Bystrc. In 13th century Monk's mountain belonged to a feudal castle Veveří. In the year 1373 was presented by earl Jan to a convent by church of Holy Thomas. Only since 18th century is called Monk's mountain. In 1948 was given from original possession of Augustian convent in the „Old Brno“ to a property of the state, under the control of ministry of agriculture. In 1949, Monk's mountain belonged to a Masaryk university in Brno, and Botanic garden was founded there. After the treaty between association and representatives of university was put forward to found ZOO. 1950 (9.2.) 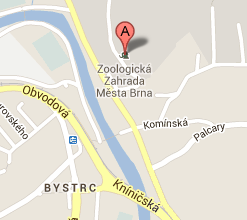 Regional national committee set up cooperative to build ZOO in Brno. (11.2.) Monk's mountain was proclaimed „state natural reservation“. (6.5.) Regional national committee changed cooperative for build ZOO into organizational unit with the name: Zoological garden – ZOO. (1.6.) The first work on a stony ground of the Monk's mountain – construction of the ZOO. 1953 (30.8.) ZOO was opened with glory. 1957 Whole the Monk's mountain was committed to a ZOO and for Botanic garden was chose other place. 1958 City national committee, department of education and culture undertook management of the ZOO. 1990 Municipal authorities of Brno city, department of culture became constituter of ZOO Brno. 1992 ZOO Brno belonged under department of life setting (under municipal authorities of Brno city). 1997 MVDr. Martin Hovorka, Ph. D.
1998 General reconstruction of the right half of the reptile pavilion. The Tropical Kingdom was opened. Majority of properties in ZOO Brno was built in action „Z“. Only VET ambulance was built by „Land construction Brno“ supply. Ing. Ivan Otruba worked project of greens ZOO Brno. 2000 The Tiger Rocks – exhibit for Sumatra tigers and Ceylon leopards with the area of one thousand square meters with artificial rocks, waterfalls, creeks and ponds. 2003 1st part of exhibit Beringia for Canadian Beavers with area of 750 square meters. Reservoir for beavers is 32 meters long and 5,5 m in the largest part. There is also replica of Canadian Indian loghouse of Haida tribe. 2004 2nd part of exhibit Beringia for Mackenzie Valley Wolves. The hectare natural exposition, which brings to the zoo Canada nature. 2006 Reconstruction of Children Zoo. Exhibit for brown bears was adapted for polar bears. Original walk for Barbary sheep was expanded for Barbary sheep and geladas living together. Reconstruction of exhibit for buffalos. Near exhibit was built new Indian village with five tee-pees . 2007 Train for visitors started work. 2008 New main road and path through Zoo was built. Enclosures for Patagonian maras, Meerkats, Canada lynxes and Red-crowned cranes were built. 2009 Reconstruction of the hall of administrative building of the zoo. New exhibit for Meerkats. 2011 New exhibit for Polar Foxes. New exposition for Sri Lanka Leopards. Alternate exhibit for Polar bear male. In July, a new aviary was opened for Bald Eagles, an exhibit for Eastern Chipmunks, an exhibit for North American Porcupines and an exhibit for Striped Skunks. The second new exhibit was a walk-through run for Rock-wallabies. The last exhibit opened in 2014 (October) was the African Village. The visitors can find a walk-through aviary for a flock of Red-billed Queleas, a lake with Greater Flamingos, Fulvous Whistling Ducks and White-faced Whistling Ducks, an island inhabited by a group of Ring-tailed Lemurs, and two runs for Boer Goats and Guinea Fowls.